The second highest cause of automobile crashes is rear-end collisions – 17 percent. Thousands of people die. The solution? "It is simple," said Clay Gabler, a professor of biomedical engineering at Virginia Tech. "Slow the striking vehicle." The concept is simple. Execution is complex and expensive. But in a life-and-death scenario, it is worth the investment, agree Gabler and Kristofer Kusano of Herndon, Va., a doctoral student in mechanical engineering. In affiliation with the Virginia Tech-Wake Forest Center for Injury Biomechanics and the Virginia Tech Transportation Institute, they are conducting research on the potential benefit of a suite of collision avoidance systems now available as options on some new cars. Their research, which has been published in peer-reviewed journals, predicts that the use of three systems may reduce serious injuries by 50 percent. Gabler and Kusano are looking at three systems that can operate independently or in sequence to prevent or mitigate a front collision. They have looked at one generic system that begins with a warning 1.7 seconds before a potential crash. Once alerted, if the driver begins to apply the brakes, there is brake assistance. "The car says, 'Let me show you how to do it more effectively and applies the necessary braking force'," said Gabler. Finally, 0.45 seconds before the collision, the car will add 0.6 G to the braking effort, or if there is no braking, will apply the brakes autonomously. "These systems require radar and sophisticated computers. So there is a lot of interest in determining how efficient they could be to guide development," said Kusano. He and Gabler looked at collisions from the National Automotive Sampling System/Crashworthiness Data System for 1993 to 2008. U.S. Department of Transportation crash teams look at about 5,000 crashes a year out of some 6 million police-reported crashes. Investigation includes photographing and diagramming the scene of the collision, collecting information from police and medical records, conducting interviews with the occupants, and measuring damage to the vehicles. To be investigated, crashes must involve at least one passenger vehicle, and at least one vehicle must have been towed from the scene due to damage. The Virginia Tech researchers extracted 1,396 incidents of rear-end collisions from this database and looked at them on a case-by-case basis to determine whether the intelligent vehicle systems being studied would have been called into play and, if so, how they would have helped. 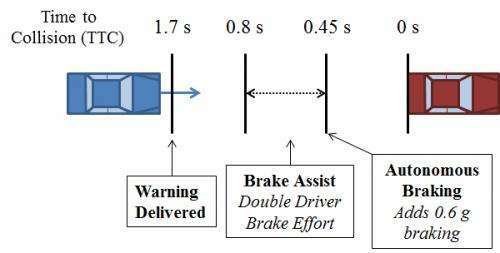 Kusano and Gabler's research appears in the paper, "Safety Benefits of Forward Collision Warning, Brake Assist, and Autonomous Braking Systems in Rear-End Collisions," published online in April as an early access article for inclusion in a future issue of the journal IEEE Transactions on Intelligent Transportation Systems. "Warning works in alerting a distracted driver so they apply the brakes," said Gabler. The study of the crashes determined that 71 percent of the drivers were braking and 29 percent were not. Simulations were run of the crashes, and then assisted or autonomous braking was simulated. The research showed that 7.7 percent of crashes would be prevented by use of all three systems – warning, assisted braking, and autonomous braking. "We looked at one generic system with a 1.7 second warning. If the warning were sooner, it would prevent more crashes, but there would also be false alarms, which results in drivers turning the systems off or ignoring warnings," Gabler said. But the research sponsor, Toyota's Collaborative Safety Research Center, is interested in more than how many crashes would be prevented. "They pointed out, 'There are people in those cars.' And they asked, 'Can injuries and fatalities be prevented? '," said Gabler. The research showed that use of all three systems may have the potential to reduce injuries by 50 percent. "That surprised me," said Kusano. "That is on a level with seat belts." Kusano and Gabler are also looking closely at driver behavior. "Not accounting for driver behavior may overestimate the potential target population for a safety system," said Gabler. They used the National Motor Vehicle Crash Causation Survey. To be included in the survey, Emergency Medical Services must have been activated and an investigator must have been at the scene of the crash before it was cleared. This allowed investigators to interview occupants, witnesses, and first responders in order to determine factors which led to the crash—details not available in traditional crash databases that focus on injury. The Virginia Tech researchers examined the critical reason assigned by the crash investigator to each crash, then determined the behavior that resulted in the most common type of fatal crashes, which are road-departures, and the most common type of all crashes, rear-end crashes. For road departures, performance errors, such as poor directional control or overcompensation, were the most frequent critical reason for the crash for 23 percent of drivers. Distraction was the next most common critical reason for 22 percent; and non-performance errors, such as falling asleep or having a serious illness prior to the crash, was the most common critical reason for 21 percent of road departures. Speed-related critical reasons were cited in 19 percent of collisions. The most frequent pre-crash scenario for rear-end collisions was driver distraction, accounting for 51 percent of such collisions. "Drivers in rear-end collisions that are distracted and as a result take no or inadequate avoidance maneuvers may benefit the most from forward collision warning and brake assist," Kusano reported at the 2012 IEEE Intelligent Vehicles Symposium in June. Kusano started doing research as an undergraduate student. "I wanted a semester job. A classmate, (Stephanie Comas of Centreville, Va., a 2012 master of science graduate of biomedical engineering), who is now my wife, had a summer job with Dr. Gabler. She told me he was looking for more people." Kusano started by helping graduate students, working on pieces of different projects. "Impact testing guard rail was my first project." He came back every summer and the projects got bigger. "Going into my senior year, I began working on the first Toyota project." Kusano wrote and presented a paper to the Society of Automotive Engineers on research to identify the target population for collision avoidance systems. It is one of three presentations he has made at this conference so far, and one of two for which he received an Outstanding Paper Award. Together, Kusano and Gabler have published over 10 peer-reviewed papers in journals and conference proceedings on these pre-crash braking systems.